In 1913 the National Union of Women Suffrage Societies (NUWSS) had nearly had 100,000 members. Katherine Harley, a senior figure in the NUWSS, suggested holding a "Woman's Suffrage Pilgrimage" in order to show Parliament how many women wanted the vote. According to Lisa Tickner, the author of The Spectacle of Women (1987) argued: "A pilgrimage refused the thrill attendant on women's militancy, no matter how strongly the militancy was denounced, but it also refused the glamour of an orchestrated spectacle." Members of the NUWSS set off on 18th June, 1913. The North-Eastern Federation, the North and East Ridings Federation, the West Riding Federation, the East Midland Federation and the Eastern Counties Federation, travelled the Newcastle-upon-Tyne to London route. The North-Western Federation, the Manchester and District, the West Lancashire, West Cheshire and North Wales Federation, the West Midlands Federation, and the Oxfordshire, Berkshire, Buckinghamshire and Bedfordshire Federation travelled on the Carlisle to the capital route. The South-Western Federation, the West of England Federation, the Surrey, Sussex and Hampshire Federation walked from Lands End to Hyde Park. 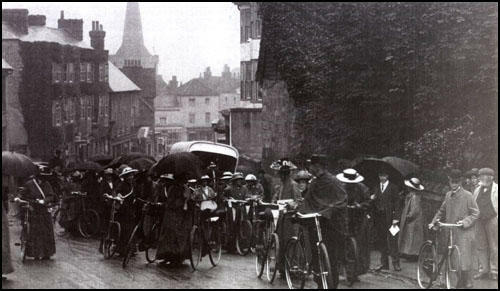 Cyclists at Clayton on the Brighton Road on the NUWSS Pilgrimage in July 1913. As Elizabeth Crawford, the author of The Suffragette Movement (1999), pointed out: "Pilgrims were urged to wear a uniform, a concept always close to Katherine Harley's heart. It was suggested that pilgrims should wear white, grey, black, or navy blue coats and skirts or dresses. Blouses were either to match the skirt or to be white. Hats were to be simple, and only black, white, grey, or navy blue. For 3d, headquarters supplied a compulsory raffia badge, a cockle shell, the traditional symbol of pilgrimage, to be worn pinned to the hat. Also available were a red, white and green shoulder sash, a haversack, made of bright red waterproof cloth edged with green with white lettering spelling out the route travelled, and umbrellas in green or white, or red cotton covers to co-ordinate civilian umbrellas." Members of the NUWSS publicized the Women's Pilgrimage in local newspapers. Helen Hoare, for example, sent a letter to The East Grinstead Observer: "It is no doubt true that some men were formerly inclined to support it have been alienated by the doings of the militant party. The National Union of Womens Suffrage Society (that is the law-abiding, non-militant party), in order to show the world that it is alive, and to encourage its members in a long and disheartening struggle, has organised a great pilgrimage from all parts of England to London." Lisa Tickner has pointed out: "Most women travelled on foot, though some rode horses or bicycles, and wealthy sympathisers lent cars, carriages, or pony traps for the luggage. The intention was not that each individual should cover the whole route but that the federations would do so collectively." One of the marchers, Margory Lees, claimed that the pilgrimage succeeded in "visiting the people of this country in their own homes and villages, to explain to them the real meaning of the movement." Another participant, Margaret Greg, recorded: "My verdict on the Pilgrimage is that it is going to do a very great deal of work - the sort of work that has hitherto only been done by towns or at election times is being spread all over the country." The pilgrims were accompanied by a lorry, containing their baggage. Margaret Ashton brought her car and picked up those suffering from exhaustion. 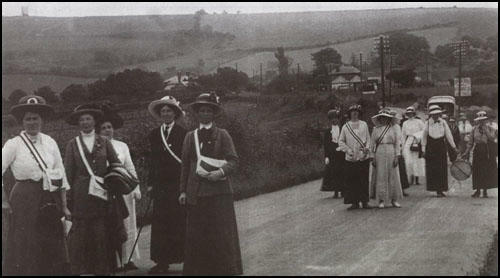 Frederick Douglas Miller photographed the NUWSS Pilgrimage in Sussex in July 1913. During the next six weeks held a series of meetings all over Britain where they sold The Common Cause and other NUWSS literature. The meetings held on the way were nearly all peaceful. However, the women had to endure a great deal of abuse. Harriet Blessley of Portsmouth recalled: "It is difficult to feel a holy pilgrim when one is called a brazen hussy." 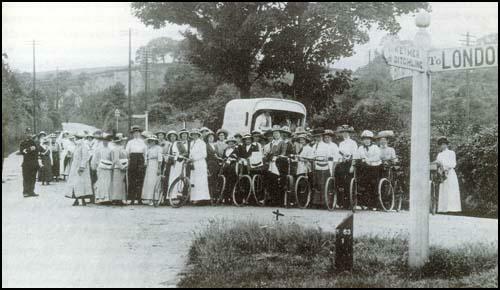 Cyclists in Cuckfield on the NUWSS Pilgrimage on 22nd July 1913. A serious riot took place at a meeting organised by Marie Corbett of the East Grinstead Suffrage Society and Edward Steer of the Men's League for Women's Suffrage at East Grinstead three days before the end of the march. As the The East Grinstead Observer reported: "The procession was not an imposing one. 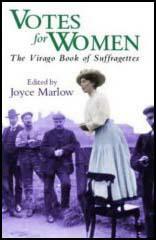 It consisted of about ten ladies who were members of the Suffrage Society. Mrs. Marie Corbett led the way carrying a silken banner bearing the arms of East Grinstead. The reception, which the little band of ladies got, was no means friendly. Yells and hooting greeted them throughout most of the entire march, and they were the targets for occasional pieces of turf, especially when they passed through Queens Road. In the High Street they found a crowd of about 1,500 people awaiting them." Edward Steer was the chairman and Laurence Housman was the main speaker. The local newspaper reported that both men were attacked by the crowd: "By this time pieces of turf and a few ripe tomatoes and highly seasoned eggs were flying about, and were not always received by the person they were intended for. The unsavoury odur of eggs was noticeable over a considerable area. Unhappily, Miss Helen Hoare of Charlwood Farm, was struck in the face with a missile and received a cut on the cheek and was taken away for treatment." Despite this riot The Common Cause reported that overall the pilgrimage was a great success and "the result was nothing less than a revelation, to those who doubted it, of the almost universal sympathy given to the Non-militant Suffrage Cause once it is understood." The Daily News commented on the woman's brown skins on the march and added "never was so peaceful, so pleasant a raid of London - and rarely one more picturesque or more inspiring." An estimated 50,000 women reached Hyde Park in London on 26th July. 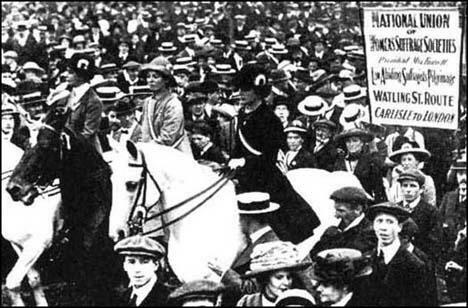 As The Times newspaper pointed out, the march was part of a campaign against the violent methods being used by the Women Social & Political Union: "On Saturday the pilgrimage of the law abiding advocates of votes for women ended in a great gathering in Hyde Park attended by some 50,000 persons. The proceedings were quite orderly and devoid of any untoward incident. The proceedings, indeed, were as much a demonstration against militancy as one in favour of women's suffrage. Many bitter things were said of the militant women." On 29th July 1913, Millicent Fawcett wrote to Herbert Asquith "on behalf of the immense meetings which assembled in Hyde Park on Saturday and voted with practical unanimity in favour of a Government measure." Asquith replied that the demonstration had "a special claim" on his consideration and stood "upon another footing from similar demands proceeding from other quarters where a different method and spirit is predominant." At the present time it is alleged by many that "the cause of Womens Suffrage is dead". It is no doubt true that some men were formerly inclined to support it have been alienated by the doings of the militant party. The National Union of Womens Suffrage Society (that is the law-abiding, non-militant party), in order to show the world that it is alive, and to encourage its members in a long and disheartening struggle, has organised a great pilgrimage from all parts of England to London. On 23rd July, those from the south will pass Crawley, where the East Grinstead Suffragists will join them on the march to London and the great demonstration in Hyde Park on 26th July. The Pilgrimage proper began on Wednesday, June 18th, at 10 a.m., when a good procession left the Market Cross with banners in front and a baggage cart, covered with red, white and green, bringing up the rear. A fine contingent from Keswick, including Lady Rochdale, Mrs. Frank Marshall, Mrs. John Marshall, .... (and others) had come to Carlisle for the start, bringing the Keswick banner with them. Lord Rochdale's car and Mrs. Marshall's pony-cart, bravely decorated with flags, also started from Carlisle and accompanied the pilgrims throughout the whole Federation, being of' unspeakable help and value and enabling us to work a much larger area than would otherwise have been possible in the time. It would be difficult to give an accurate account of numbers, as pilgrims by the dozen have joined us in the towns and villages as we went through. Some of these have been able to do only a short stage, others have gone forward for much longer periods. (3) On 26th July 1913, The East Grinstead Observer reported a riot that had taken place in the town three days previously. The main streets of East Grinstead were disgraced by some extraordinary proceedings on Tuesday evening. The non-militant section of the advocates of securing womens suffrage had arranged a march and public meeting on its way to the great demonstration in London. The "procession" was not an imposing one. It consisted of about ten ladies who were members of the Suffrage Society. Mrs. Marie Corbett led the way carrying a silken banner bearing the arms of East Grinstead. The reception, which the little band of ladies got, was no means friendly. Yells and hooting greeted them throughout most of the entire march, and they were the targets for occasional pieces of turf, especially when they passed through Queens Road. In the High Street they found a crowd of about 1,500 people awaiting them. Edward Steer had promised to act as chairman, and taking his stand against one of the trees on the slope he began by saying, "Ladies and Gentlemen". This was practically as far as he got with his speech. Immediately there was an outburst of yells and laughter and shouting. Laurence Housman, the famous writer, got no better than Mr. Steer. By this time pieces of turf and a few ripe tomatoes and highly seasoned eggs were flying about, and were not always received by the person they were intended for. The unsavoury odur of eggs was noticeable over a considerable area. Unhappily, Miss Helen Hoare of Charlwood Farm, was struck in the face with a missile and received a cut on the cheek and was taken away for treatment.
. Mrs. Marie Corbett slipped away and took up a position lower down the High Street on the steps of the drinking fountain. A young clergyman who appealed for fair play was roughly hustled and lost his hat. Mrs. Corbett had began to speak from the fountain steps but the crowd moved down the High Street and broke up her small meeting. (4) Wallace Hills, Chairman of the East Grinstead Conservative Party, wrote an article in The East Grinstead Observer about what had happened on 23rd July. Mr. Steer said that the "tradesmen who had saved up rotten eggs to throw at ladies ought to be ashamed of themselves." On Saturday the pilgrimage of the law abiding advocates of votes for women ended in a great gathering in Hyde Park attended by some 50,000 persons. The proceedings were quite orderly and devoid of any untoward incident. 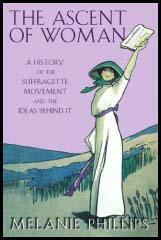 The proceedings, indeed, were as much a demonstration against militancy as one in favour of women's suffrage. Many bitter things were said of the militant women.